Fall weekends are a great time to gather with friends and family and root for your favorite football team. Whether the celebration takes you to a little league field, a professional stadium, or the neighbor’s living room, a crowd-pleasing platter of steak fajitas can make it a sizzling celebration. One of the secrets to great beef is meticulous attention to feeding practices. Harris Ranch is one of just a few producers in the country that produces beef exclusively from cattle fed in their own feedlot. Harris Ranch cattle spend approximately 85% of their lives grazing on grass, then they’re fed a nutritionally balanced diet of corn and other feed grains, plus alfalfa hay, vitamins and minerals. The feed is milled at Harris Ranch under the guidance of a consulting animal nutritionist. The result is a juicy, flavorful cut of beef. 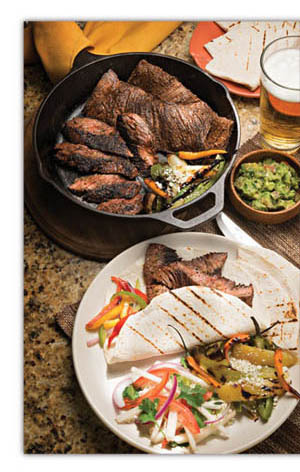 Harris Ranch House Fajitas are a great recipe to keep handy when entertaining a hungry crowd since the preparation is easy, and the recommended skirt steak, flank steak, or flap meat, are inexpensive cuts that won’t break the bank. The following recipe serves 4-6 hungry people, but can easily be multiplied to feed a whole team. Combine above ingredients and refrigerate. Slice steak across the grain into 1/4″-1/2″ strips and marinate for at least four hours, or overnight if desired. Remove meat from the marinade and discard. In a sauté pan, sauté beef, onion and bell pepper over medium heat until beef is browned and onion and bell pepper are tender. Stir in wedged tomatoes and sauté for five minutes more. Serve immediately with warm flour tortillas, grated cheese, sour cream, salsa and guacamole. Serves 4-6.